Is Eiffel Tower Restaurant getting a little time-worn after fifteen years? Yes. Is it a tourist restaurant? By all means. And do they change the menu about as often as most people change cars? Absolutely. Then why is it one of our precious Top 50? For two reasons, pilgrim. 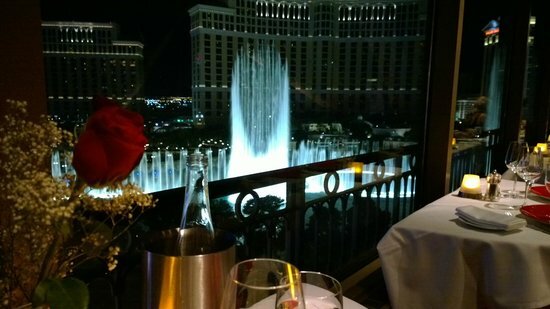 One: it remains one of the most spectacular restaurant in Vegas, if not the entire United States; and, two: more people probably get engaged (or celebrate anniversaries) here than in any spot in the world. It all starts with the private elevator on the main floor of Paris that whisks you to a lofty perch inside the hotel’s scaled-down version of La Tour Eiffel. The elevator opens and there you are facing … the kitchen! Not just any old kitchen, but a gleaming white-and-stainless-steel area filled with the cacophony and the aroma of great cuisine being created. Diners are then led past the Art Deco bar to the hostess stand, where the restaurant spreads out before you. The effect transports a diner back to 1920s Paris, but with the flash of casinos as background instead of the Arc de Triomphe. Executive Chef Juong Sohn gave way last year to Dan Rossi (formerly of Scarpetta) and they both do the cuisine of Chicago’s Jean Joho proud, with consistently delicious renditions of whole Dover sole, olive oil-poached halibut, and a rack of lamb with tarragon jus that would be right at home on the Champs Elysée. Being open for lunch is also a big plus for those who want to experience all this grandeur at much softer prices. Max Jacobson says: We tend to overlook this room because it caters to tourists who come mainly for the view, but the restaurant offers the complete package: an exquisite Sunday brunch, great cocktails, window tables perched over the Bellagio fountains, and a staff that has been here since day one…If you have a sweet tooth, try the ethereal pistachio soufflé for dessert. Favorite Dishes: Maine Peekeytoe Crab Salad; Cold Foie Gras Torchon; Roasted Foie Gras With Marinated Grapes; Bleu Cheese Soufflé Pudding; Marinated Quail With Brioche Pudding; Fricassee Of Escargot And Sweetbreads; Olive Oil-Poached Halibut With Herbed Couscous; Whole Boneless Dover Sole; Rack Of Lamb With Tarragon Jus; All soufflés; All desserts. I’ve been there twice for a late snack and twice for lunch, always had the same thing: the baked vegetarian crepes. The first three were formidable. Last time, not so much. Maybe it was the cocktail paring? Previous trip I’d had tea. I hope that was momentary glitch and not a sign of decline.